This is a brilliant, tasty and simple dish to make. I did it as a starter for six people. I just threw it in the middle and carved it up with a pizza wheel. Went down a storm. 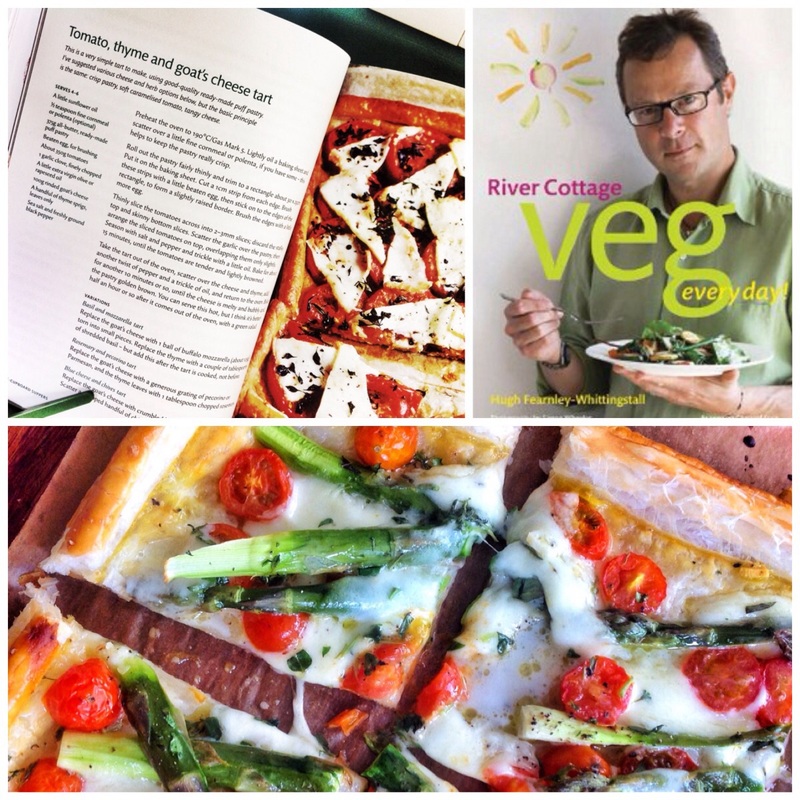 The recipe comes from the ever reliable Hugh Fearnley Whittingstall (River Cottage) and his equally reliable Veg book. 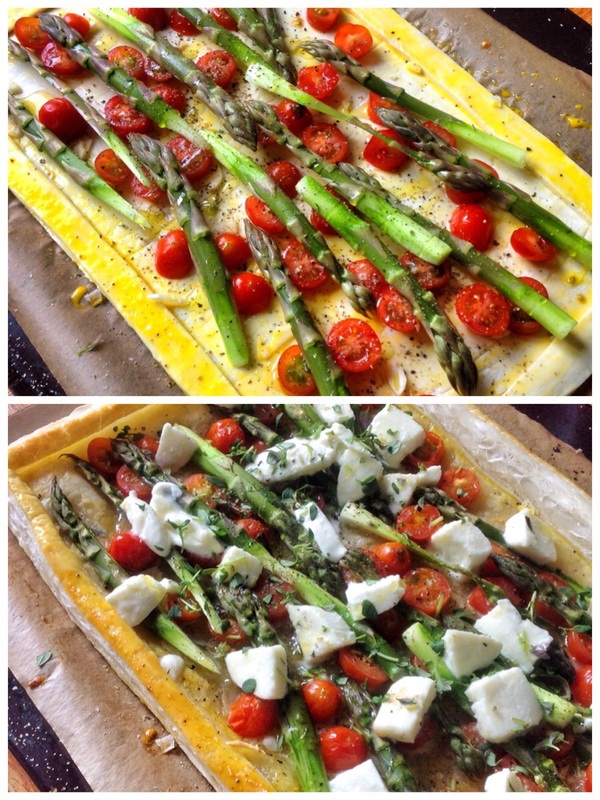 The basic ingredients are the puff pastry, some veg, some herbs and some cheese! You could apply some variations quite happily with equally good results. Ive done a few versions. They all work. The basic principle is the same: crisp pastry, soft caramelised tomato, tangy cheese. Preheat the oven to 190°C/Gas Mark 5. Lightly oil a baking sheet and scatter over a little fine cornmeal or polenta, if you have some – this helps to keep the pastry really crisp. 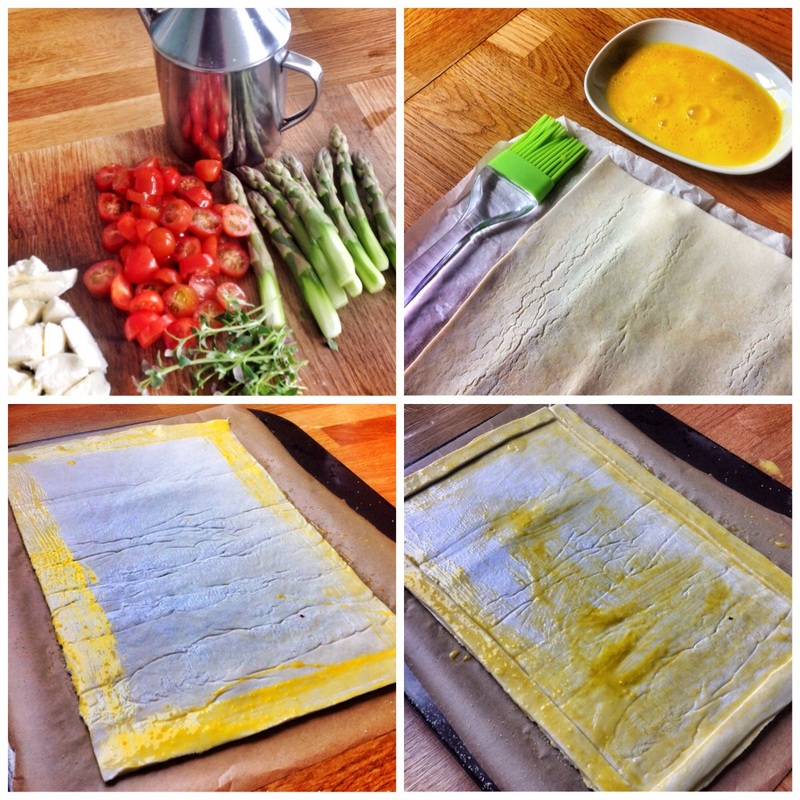 Roll out the pastry fairly thinly and trim to a rectangle about 30 x 25cm. Put it on the baking sheet. Cut a 1cm strip from each edge. Brush these strips with a little beaten egg, then stick on to the edges of the rectangle, to form a slightly raised border. Brush the edges with a little more egg. Thinly slice the tomatoes across into 2–3mm slices; discard the stalky top and skinny bottom slices. Scatter the garlic over the pastry, then arrange the sliced tomatoes on top, overlapping them only slightly. I used cherry tomatoes on this occasion and simply scattered them over. Season with salt and pepper and trickle with a little oil. Bake for about 15 minutes, until the tomatoes are tender and lightly browned. Take the tart out of the oven, scatter over the cheese and thyme, add another twist of pepper and a trickle of oil, and return to the oven. Bake for another 10 minutes or so, until the cheese is melty and bubbly and the pastry golden brown. You can serve this hot, but I think it’s better half an hour or so after it comes out of the oven, with a green salad. Replace the goat’s cheese with 1 ball of buffalo mozzarella (about 125g), torn into small pieces. Replace the thyme with a couple of tablespoons of shredded basil – but add this after the tart is cooked, not before. Replace the goat’s cheese with a generous grating of pecorino or Parmesan, and the thyme leaves with 1 tablespoon chopped rosemary. Replace the goat’s cheese with crumbled blue cheese. Omit the thyme. Scatter a chopped handful of chives over the tart once it is cooked.